Howlin' Wolf Records: SIX STRINGS: Frontiers Music: BLACKMORE'S NIGHT's "All Our Yesterdays"
Frontiers Music: BLACKMORE'S NIGHT's "All Our Yesterdays"
On September 18, 2015, Frontiers Music SRL will release ALL OUR YESTERDAYS, the tenth studio album from Blackmore’s Night, the world’s number one Renaissance act and one of the most popular folk-rock bands in the world. ALL OUR YESTERDAYS will be released in the United States on a variety of formats: CD, CD/DVD and Digital versions on September 18 and in LP and Box Set configurations on October 16. Please note these are U.S. release dates. Pre-orders for the CD, CD/DVD and Digital versions are available on Amazon.com here: radi.al/BlackmoresNightAmazon and the Digital version on iTunes/Apple Music here: radi.al/BlackmoresNightiTunes. Candice Night and Ritchie Blackmore’s lives and creative journeys have taken them through different characters and songs from a variety of times in history. That is part of the attitude in the song "Where Are We Going from Here,” about a traveling minstrel’s journey through life and age. The title track (and also the first single and video), “All Our Yesterdays” echoes the sounds of Candice’s Russian roots, while a new song written by Germany’s George Hesse is an old-style, fiddle-driven instrumental with the Welsh title “Allan yn y Fan” (meaning “Out There”). Ritchie’s heritage includes family from Wales. The album also includes stunning instrumentals: the acoustic guitar piece, “Queen’s Lament” and the dramatic “The Darker Shade of Black” that spotlights violin and guitar. 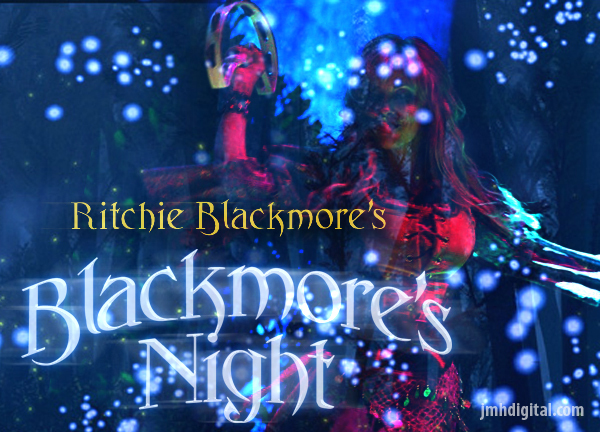 Blackmore’s Night is a true musical and spiritual collaboration between vocalist/multi-instrumentalist Candice Night and her husband, legendary guitarist Ritchie Blackmore. The two met in 1989 when Deep Purple challenged Candice’s then radio station to a charity soccer match. In 1993 she sang on Rainbow’s DIFFICULT TO CURE tour. They co-wrote four songs for Rainbow’s STRANGER IN US ALL and in 1997 they formed Blackmore’s Night; they continue to play Faire Festivals all over the world.